When your lead character's undead relative flashes back to a town full of pioneers, singing "I'm gonna pop some tags! Only got twenty dollars in my pocket! ", you know the tale at hand is a vampire yarn unlike any other. Now I know what you're thinking. One: Parent logic tells us back then, twenty bucks went a lot further than it does today (it sure brought more comics), so it really would be reason to sing, and two: from Blade to True-Twi-Teen-Buff-Nightwatch you're a bit drained of your vampiric enthusiasm. Well prepare to be reconverted. Launching from Mark Waid and John Rogers’ Thrillbent.com, Varney The Vampire mixes family legacy, ghouls and South Park level humour, to lift the tale of broke B-grade horror movie writer, Simon Gruber, above that of Goon or Hellboy, and strongly into a 'M' rated wonderland. As his deadlines mount and relationships become car wrecks, Simon finds himself the inheritor of an eerie mansion. While in Stephen King's The Shining, the haunted building came with spirits good and bad, in Simon's case, the neighbourhood and those watching from afar are equally divided. Why? Because his new abode comes with one long lost relative and a catch. Varney, a man who had his rep as the first vampire stolen by you-know-who, now wants his bloodline to help him reclaim his due the only way Gruber can, by turning his 'true story' into a film (that is, if he and Simon don't kill each other first). While Varney looks to Tinseltown to rake Bram Stoker's rep over the coals and restore his own, Thrillbent does not share the vampire's tunnel vision. Instead the indie Publisher has just released the entire first chapter of this free-to-read online comic, as part of their Kickstarter campaign to fund and print the initial arc of the series, in BOTH print and digital mediums. Now if that sounds like something you'd like to help put the boot into, Varney's Kickstarter is offering some pretty sweet rewards. Eighteen comic artists have created and signed a colour Varney The Vampire movie 11x17 lobby card, including Kelley Jones' at the top of this article. While the original art for these cards will also go up for sale to help the series' remaining production costs, you can can pledge for digital, print, or lobby card Varney The Vampire combo packages, or to have your own art reviewed by professional artists, inkers and colorists! What do you think? To pledge, read the first chapter or just flat out see more Varney The Vampire, click here. For the full press release, click here. 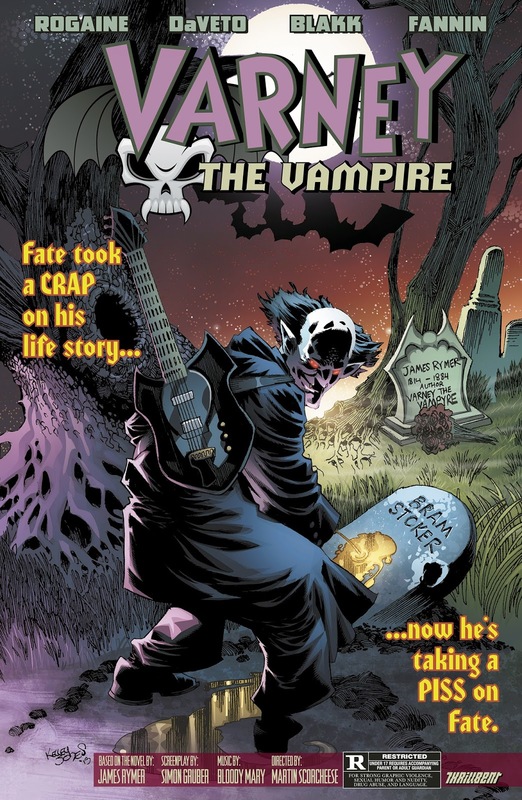 February 25, 2014 — On February 24th, Mark Waid and John Rogers’ Thrillbent.com launched the entire first chapter of an original free-to-read dramedy comic, VARNEY THE VAMPIRE, as part of an independent creator’s Kickstarter campaign, launched synchronously, to fund and print the initial arc of the series in digital and print – both of which will bear the Thrillbent label. "As I've been saying, in my mind, it's not 'Digital versus Print,‘ it‘s Digital AND Print. It‘s about maximizing outreach, which this does,‘" said Thrillbent publisher Mark Waid. "I've had my eye on VARNEY for a while now. It‘s clever, it‘s really well done, and Thrillbent is happy to promote it. Writer Scott Massino and seasoned comics artist Scott Kolins, with whom I've collaborated in the past, have cooked up a tale about the most terrifying blood-suckers known to man: vampires, family and Hollywood." In addition to Waid, VARNEY has already garnered praise from such acclaimed authors as: Mike Carey, Dan Abnett, Bruce Jones, Victor Gischler, Michael Avon Oeming, Stuart Moore, and Joshua Hale Fialkov. SYNOPSIS: His exploits stolen by Bram Stoker in "Dracula" and later made a Hollywood legend, the world's first vampire hires his present-day screenwriter kin to reclaim his rightful reputation. The book was created to revive the vampire genre, and to fill a gap in the current Horror-Comedy comic book market. "Right now, 'Hellboy‘ and 'The Goon‘ are all we've got. Sure, they both do what they do very well, but Teen or Teen+ content only goes so far with some fans. Now, thanks to Thrillbent and Kickstarter, Scott Kolins and I can bring a Rated M book to the table. VARNEY is 'South Park‘ in its laughs, but also smart and scary. It asks some startling questions that we may not like the answers to." Conceived with an eye toward Hollywood, VARNEY THE VAMPIRE the movie is a big part of the book‘s storyline. To that end, eighteen comic book artists – many of them industry legends -- have each created a VARNEY movie poster to be reproduced for a full-color, limited run of Kickstarter-exclusive, 11x17 lobby cards -- each signed by its artist and slabbed by CGC, the Comics Guarantee Corporation. These artists are: Darick Robertson, Glenn Fabry, Kelley Jones, Kyle Hotz, Frank Brunner, Mike Ploog, Herb Trimpe, Val Mayerik, Bret Blevins, Fred Hembeck, Jamal Igle, Janet Lee, Stephen Segovia, Bob McLeod, Esteban Maroto, Marcio Takara, Scott Kolins, and Andrew Robinson. Each artist has also generously donated their original piece to be put up for pledge to help fund the remaining production. Fans and dealers can pledge for digital, print, or lobby card combo packages, while aspiring comic book artists can pledge to have their work reviewed by professional artists, inkers and colorists. Names like: Jamal Igle, Stephen Segovia, Michael Oeming, Dan Panosian, Jeff Johnson, Tim Townsend, Marcio Takara, Mico Suayan, Sean Galloway, Scott Kolins, David Baron, Romulo Fajardo, and Adam Brown. ABOUT THRILLBENT: Thrillbent Comics, founded by Mark Waid and John Rogers in 2012, is a showcase for unique creator-owned digital comics by a number of established and up-and-coming talents, all eager to work in a wide and eclectic variety of genres. ABOUT MARK WAID: Mark Waid, a New York Times bestselling author, has written thousands of comic books and graphic novels in his 28-year career. His award-winning graphic novel with artist Alex Ross, KINGDOM COME, is one of the most popular and influential comics collections of all time. Currently, he writes DAREDEVIL for Marvel Comics, IRREDEEMABLE for BOOM! Studios, and ROCKETEER: CARGO OF DOOM for IDW. ABOUT SCOTT MASSINO: Scott Massino is a lifelong comic book fan, die-hard literati and cinephile. He has written sketch comedy and done voiceover work for popular radio morning shows in Illinois. His scripting skills were honed by author Kay Johnson, former P.A. to legendary director Stanley Kubrick. ABOUT SCOTT KOLINS: Scott Kolins is a lifelong fan of comic books and has been a professional comics artist for many years. He is best known for his critically acclaimed work on THE FLASH, as well as THE AVENGERS, GREEN LANTERN, MARVEL TEAM –UP, ROGUES‘ REVENGE, BEYOND, SUPERMAN-BATMAN, OMEGA FLIGHT, THE JSA, THOR, WONDER WOMAN and HAWKEYE.